New Delhi: Hisar in Haryana votes on Thursday for its next Lok Sabha MP. The election has turned into a huge prestige point between the Congress and anti-corruption crusader Anna Hazare. Anna and his activists have asked voters not to support the Congress. A defeat for the party, they say, will prove that its leaders need to ensure a new anti-corruption Jan Lokpal Bill (People's Ombudsman Bill) is passed in Parliament in the winter session. Digvijaya Singh of the Congress has today written a letter to Anna, asking the Gandhian to reconsider his stand. "I am writing this open letter to you with great regret. I have great respect for you and this is a sentiment that I have held ever since I visited you in Ralegaon Siddhi. However, a few developments in recent weeks have put me in a dilemma. It looks as if a few people who are close to you are influencing you. 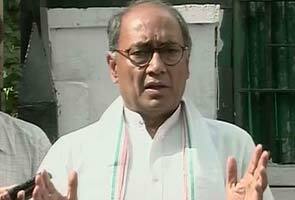 These are people who have always opposed Congress ideology," Mr Singh said. "If you are willing to take part in political process, you should participate openly," he has dared. Mr Singh has repeatedly accused Anna of being propped up by the opposition BJP, and its right-wing parent body, the Rashtriya Swayamsewak Sangh (RSS). He boosted those allegations by recently stating, "I have heard that BJP has told Anna Hazare that he could be the all-party candidate for the 2012 President's election. It is for Anna Hazare to tell us if anything like this has been proposed to him since he always says that he is not a political person." Anna is not visiting Hisar personally. But his representatives including Arvind Kejriwal and Kiran Bedi have addressed numerous rallies urging people to prove to the Congress that they will not tolerate "a government of the corrupt." In retaliation, Mr Singh has said in his letter today, "The government is committed to pass the Lokpal Bill. Why have you adopted an anti-Congress stance?" The by-election comes after Bhajan Lal of the Haryana Janhit Congress Party died in June while still serving his term. His son, Kuldeep Bishnoi, is the candidate for the Haryana Janhit Congress. He faces stiff competition from Ajay Chautala of the Indian National Lok Dal (INLD). The Congress has chosen as its candidate Jai Prakash. He placed third in the elections for the same Lok Sabha seat in 2009, but enjoys the confidence of Haryana Chief Minister Bhoopinder Singh Hooda.